The true weird tale has something more than secret murder, bloody bones, or a sheeted form clanking chains according to rule. A certain atmosphere of breathless and unexplainable dread of outer, unknown forces must be present; and there must be a hint, expressed with a seriousness and portentousness becoming its subject, of that most terrible conception of the human brain - a malign and particular suspension or defeat of those fixed laws of Nature which are our only safeguard against the assaults of chaos and the daemons of unplumbed space. Remember: if you see something, say nothing, and drink to forget. – Joseph Fink and Jeffrey Cranor, “Glow Cloud,"
Imagine living in a small desert community where every conspiracy theory is true and the laws of nature are only of little relevance. This is the premise of the podcast Welcome to Night Vale, presented in the style of a community radio show. In Night Vale, menacing world governments, portals to other dimensions, and otherworldly creatures are part of everyday life. Few episodes of the podcast pass without at least some of the citizens of Night Vale dying. Yet, somehow, the horror of living in the small town is presented in an extremely comical way. The characters of Night Vale, so it seems, have grown so accustomed to their situation that they are no longer surprised by the weird things they encounter. Thus, the notion of “normality" is completely turned on its head in this little community. According to Joseph Fink and Jeffrey Cranor, the podcast is reminiscent of the stories by H.P. Lovecraft. Indeed, both Night Vale and Lovecraft’s fictions feature a range of fantastical monsters that are very similar in their abnormal appearance. These creatures are marked by their grotesque nature; however, whereas in Lovecraft’s writings the grotesque evokes fear and revulsion, the grotesque in Night Vale is oddly funny. The podcast Welcome to Night Vale may feature beings that are inspired by the fantastical creatures of H. P. Lovecraft’s writings, but detaches them from their original dread and horror by recasting them in a own grotesquely comedic narration. By doing so, the podcast illustrates the large extent to which the terrifying effect of the Lovecraftian monster depends on the way it is experienced and presented in the fiction. The concept of the grotesque and its employment in both Night Vale and Lovecraft’s fictions is significant. Thus, I begin this article with an investigation of the grotesque, introducing Geoffrey Galt Harpham’s theory of the grotesque as interval. Subsequently, I discuss the use of the grotesque in the podcast Night Vale in terms of style and subject matter. In this context, two creatures featured in the podcast are compared in detail to some of the entities as they appear in H.P. Lovecraft’s writings. Lastly, tying this analysis back to Harpham’s theory of the grotesque, I explain why Lovecraft’s monsters appear as extremely horrifying in his own fictions, yet funny and even ridiculous in Night Vale. The word “grotesque" is often used to describe things that somehow go beyond that which is perceived as normal and natural, and for which there appears to be no other adequate adjective. The meaning of the term is by no means self-evident. On the one hand, the grotesque is often conceived of as terrifying and obscene, but on the other hand, it is also thought of as ridiculous and absurd. The nature of the grotesque, so it appears, is highly elusive and ambivalent. The online Oxford Dictionaries has two entries for the adjective “grotesque:" 1) “Comically or repulsively ugly or distorted," and 2) “Incongruous or inappropriate to a shocking degree." Striking in the first definition is the opposition of the terms “comically" and “repulsive." The grotesque object can either provoke laughter or disgust, and it does so by being “ugly" or “distorted." It furthermore stands out due to its inappropriateness and incongruousness, as the second definition shows. Taking both entries together, the grotesque object does not only evoke seemingly contradictory responses, but is in itself contradictory. The grotesque as a concept has been discussed by a multitude of scholars from diverse academic fields such as literature, film, cultural studies, psychology, and philosophy, to name but a few. The theories of the grotesque are as diverse as these disciplines, seemingly having only little in common. In Rabelais and His World the Russian philosopher Mikhail Bakhtin, for example, discusses the grotesque in light of the carnival culture of the Middle Ages and the Renaissance, understanding it as a playful ritualistic degradation. The German literary scholar Wolfgang Kayser, on the other hand, views the grotesque as terrifying and alienating. Yet another scholar, Geoffrey Galt Harpham, interprets the grotesque as an interval, a gap between the perception and the comprehension of the grotesque object. According to Schuy Weishaar, one common feature of the concept reappearing in all of these theories is the ambivalent and contradictory nature of the grotesque, which eventually defies all attempts of categorization. As Istvan Csicsery-Ronay writes in “On the Grotesque in Science Fiction": “the grotesque is a projection of fascinated repulsion/attraction out into objects that consciousness cannot accommodate, because the object disturbs the sense of rational, natural categorization." In Harpham’s theory of the grotesque, this disruption of categories takes on a central role as well. In his book On the Grotesque: Strategies of Contradiction in Art and Literature, Harpham describes the essence of the grotesque as the fusion of “things that should be kept apart." The word “grotesque" in itself does not have any descriptive value, but only signifies the inadequacy of all other adjectives to properly fill in the place of the modifier: “its sole function is to represent a condition of overcrowding or contradiction in the place where the modifier should be. This place can never be occupied by any other single adjective but only by a number of adjectives not normally found together." Struggling to disentangle the confusion caused by the grotesque object and to discern its underlying organization, the perceiver is caught in what Harpham calls a “purgatorial stage of understanding," the condition of seeing, yet not understanding the object. This stage is not a rare occurrence, but is usually so brief and easily bridged by experience and reasoning that it is seldom noticed. The grotesque, however, thrives in this gap or interval between the perception of the grotesque object and comprehension of its underlying principles, elongating and exploding the moment of confusion. However, Harpham argues that the grotesque also leads to a new way of thinking. He writes: “[f]ragmented, jumbled, or corrupted representation leads us into the grotesque; and it leads us out of it as well, generating the interpretive activity that seeks closure." Out of confusion, new knowledge arises by means of the newly developed “interpretive activity" of the perceiving mind. For Harpham, the perception of the grotesque therefore is always a process or progression, in which the interval of the grotesque is entered and eventually overcome. Conceptualizing the grotesque as interval hence involves a paradox: “really to understand the grotesque," writes Harpham, “is to cease to regard it as grotesque." Once closure of the interval is achieved by means of the interpretive activity generating new ways of thinking, the grotesque is no longer recognized as such. In the book Masters of the Grotesque, Weishaar calls this paradox of the interval the “self-annihilation" of the grotesque. Csicsery-Ronay furthermore claims in his analysis of Harpham’s theory that, due to the focus on scientific achievements and technological developments, this process of the self-annihilation of the grotesque interval is especially evident in the postmodern period, where seemingly everything can be fused together and the dependence on discrete forms and categories is weakened. The podcast Welcome to Night Vale first aired in June 2012, and has been publishing episodes of approximately twenty minutes twice a month since. The grotesque is a key feature of the podcast, as the show’s pilot episode already exemplifies. Night Vale begins with the following words: “[a] friendly desert community where the sun is hot, the moon is beautiful, and mysterious lights pass overhead while we all pretend to sleep. Welcome to Night Vale." The small town is introduced as an ordinary community in the desert, yet already the show’s very first sentence indicates that something is slightly off in this town. After all, mysterious lights in the night sky and an entire town only pretending to be asleep are usually not deemed ordinary. The narrator, who is revealed to be Night Vale’s community radio host Cecil Gershwin Palmer, then continues with his narration, stating in a very calm and factual voice: "Hello listeners. To start things off I’ve been asked to read this brief notice: the city council announces the opening of a new dog park at the corner of Earl and Summerset near the Ralph’s. They would like to remind everyone that dogs are not allowed in the dog park. People are not allowed in the dog park. It is possible you will see hooded figures in the dog park. Do not approach them. Do not approach the dog park. The fence is electrified and highly dangerous. Try not to look at the dog park, and especially do not look for any period of time at the hooded figures. The dog park will not harm you. And now the news." Up to this point, barely two minutes of the episode have passed; yet, Night Vale is already full of grotesqueries, setting the stage for the podcast as a whole. There is, first of all, the crass opposition of Cecil’s matter-of-fact tone and the contents of his narration. This grotesque mode of presentation continues throughout the entire Night Vale series. Furthermore, Cecil’s calm tone indicates that the bizarre press release regarding the dog park is nothing strange or unexpected to him and that he has grown accustomed to such states of affairs in Night Vale. The fact that Night Vale’s city council issues this specific release only adds to the impression, whilst also putting the town’s leadership in a highly questionable light. It thus appears as if the community is completely desensitized to strange things like the forbidden dog park. Additionally, there is, of course, the issue of the park itself: a dog park where not only dogs but also people are forbidden, guarded by a dangerous electrical fence and ominous hooded figures – yet, the dog park is supposedly harmless. Throughout the series, the dog park remains a reccurring topic. For example, the town’s mayor not only reminds the citizens in a later episode called "The Drawbridge" that nothing strange is going on with the dog park, she even goes on to repudiate that such a thing as the dog park could possibly exist. Over the course of the podcast, Night Vale also features a diverse selection of grotesque creatures. The quarterback of the Night Vale High School football team grows a second head (“The Shape in Grove Park"), several citizens spontaneously sprout spiraled horns (“PYRAMID"), and a woman gives birth to an adult man’s detached hand, naming it Megan (“The Traveler"), to give only a few examples. The citizens of Night Vale are constantly in danger of dying in some way or another. Therefore, even though the subject matter of Night Vale may be grotesque in its otherworldliness, it should theoretically not be funny, but rather dreadful. However, through Night Vale’s mode of presentation, where the calm tone does not fit the horrifying content, in addition to its characters’ acceptance of their situation, no such sense of terror and dread ever arises. Instead, the combined use of the grotesque in terms of style and subject matter makes the podcast hysterical. The series exists in contrast to the writings of H.P. Lovecraft. 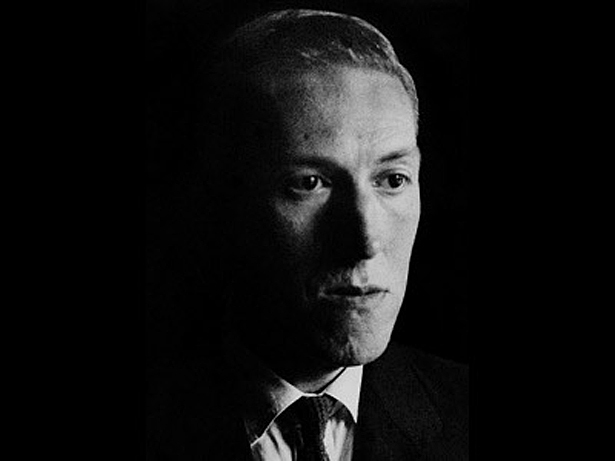 Even though Lovecraft’s fictions make use of the grotesque as well, especially in terms of its fantastical beings, the effect is very different; the writer’s stories are marked by their dismal and angst-inducing cosmic horror. On closer examination, several of the otherworldly creatures featured in Night Vale resemble monsters deemed as typically Lovecraftian in popular culture. According to Kelly Hurley, Lovecraft’s entities are usually known for their abnormal and excessive appearance marked by a bizarre hybridity. Thus, just as in Night Vale, the grotesque body is a key feature in Lovecraft’s writings as well. For example, the so-called "Elder Ones" – monsters part of Lovecraft’s infamous Cthulhu Mythos – are described in the novella At the Mountains of Madness as large creatures appearing to be vegetable- and animal-like at the same time, furthermore sprouting tentacles and wings from their torso. Similarly, in the short story “The Dunwich Horror," Wilbur Whateley, progeny of both humans and extraterrestrials, appears as “teratologically fabulous," having a “score of long greenish-grey tentacles with red sucking mouths" protruding from his abdomen. As Mark Jones notes, these tentacles or tendrils have come to be regarded as the typical characteristic of the Lovecraftian creature. In the Night Vale episode “Station Management," an entity very similar to the Lovecraftian monster is introduced, namely the station management of the Night Vale community radio. Little is known about Station Management, since they never leave their office and only communicate via letters passed under the door. Nevertheless, the narrator hints at the appearance of this creature – or creatures: “Sometimes you can see movements through the frosted glass, large shapes shifting around, strange tendrils whipping through the air." With its excessive size and bizarre tendrils, Station Management is reminiscent of the Lovecraftian monster. Another similarity is that Lovecraft’s beings, like Station Management in this particular Night Vale episode, often remain intangible and obscure. In At the Mountains of Madness, for instance, the narrator Professor Dyer only gets to see the Elder Things in hibernation, but never active. Whilst they are thought to be dead, these creatures are described meticulously by the biologist Professor Lake. However, once the creatures come back to life, killing Lake and his party, they are never seen by the narrator, thus remaining unfathomable to both Dyer and the reader of the novella. Station Management is not the only grotesque entity that seems to be inspired by the writings of Lovecraft. The mysterious “Glow Cloud," first appearing in the episode of the same name, resembles the Elder Things as they are described in At the Mountains of Madness in their mind-controlling abilities; both the Glow Cloud and the Elder Things have the power to influence their victims via hypnotic suggestion. The Glow Cloud one day approaches Night Vale, growing in size until it envelops the entire city. It glows in a variety of colors, rains down dead animals, and consists of “noxious nightmares and spiritual destruction" – a very comical reworking of the Lovecraftian sense of dismal. Looming over Night Vale, the Glow Cloud controls the minds of the citizens. Reporting the latest news regarding the Cloud, Cecil suddenly begins to worship it: "The Sherriff’s Secret Police have apparently taken to shouting questions at the Glow Cloud, trying to ascertain what exactly it wants. So far, the Glow Cloud has not answered. The Glow Cloud does not need to converse with us. It does not feel as we tiny humans feel. It has no need for thoughts or feelings of love. The Glow Cloud simply is. All hail the mighty Glow Cloud. All hail! And now, slaves of the Cloud, the weather." Station management and the Glow Cloud are only two examples for a number of creatures featured in Night Vale echoing the Lovecraftian monster. However, in the context of Night Vale, these entities are lacking the sense of terror usually accompanying them in Lovecraft’s own writings. This difference of effect in the two texts exemplifies that the Lovecraftian horror derives not only from the monsters’ appearances, but especially from the way they are represented in the fiction. As Mark Jones explains in “Tentacles and Teeth: The Lovecraftian Being in Popular Culture," the Lovecraftian horror is not only comprised of vast, tentacled creatures. Instead, the main characteristic of Lovecraft’s horror is its seriousness and unease, its imperturbable sense of cosmic alienation. Central in conveying this sense of cosmic alienation is Lovecraft’s narrative technique. Often beginning in a sober, matter-of-fact tone, the narration grows more convulsed and disturbing the closer its narrator comes to the discovery of the existence of entities such as the Elder Things. Confronted with their own insignificance and powerlessness when facing these monsters, Lovecraft’s characters – including the narrators themselves – oftentimes go mad. The student Danforth in At the Mountains of Madness, for instance, catches a “single, fantastic, daemoniac glimpse" of something – it is never explained what exactly it is he saw – and he instantly goes insane. In Night Vale, on the other hand, where everything is possible and nothing unusual, the grotesque body is no longer perceived as horrifyingly grotesque, and therefore also not conveyed as such. Instead, the "noxious nightmares" constituting the Glow Cloud, for instance, become ridiculous attributes. Even though the citizens of the desert community are exposed to dangers and creatures quite similar to those of Lovecraft’s fictions, they do not experience their typical sense of cosmic horror. Detached from dread, the Lovecraftian elements in Night Vale instead become farcical: it is, for instance, revealed that the vast and ominous Glow Cloud has joined Night Vale’s school board, and that its previous visit to Night Vale had the sole purpose of finding a “nice neighborhood with good schools to raise a child." Thus, even though the horrors described in Night Vale are in many ways similar to those of Lovecraft’s writings, they have a very different effect simply because they are experienced and narrated differently by the characters. This difference can be explained with Harpham’s theory of the grotesque as interval. The characters in Lovecraft’s fictions are incapable of comprehending the sight of the aliens they encounter versus their own insignificance. The protagonists are forever stuck in Harpham’s interval, the epistemological purgatory of seeing, but not understanding. The experience of the grotesque, following Harpham, comes at the price of “the mind poised between death and rebirth, insanity and discovery, rubble and revelation"; for Lovecraftian characters such as the student Danforth, the confrontation with the grotesque can only lead to madness. Harpham’s purgatory is the main ingredient of Lovecraft’s cosmic horror, and it can never be overcome by his characters. Accordingly, the grotesque in these fictions is always dreadful and angst-inducing, hinting at looming madness. In Night Vale, however, the situation is quite different. The citizens of the desert community have become accustomed to most of the horrors they encounter every day. The best way of coming to terms with the grotesque for the citizens in Night Vale is for them to accept the fact that strange things exist and, subsequently, ignore them. The radio host advises them: “Remember: if you see something, say nothing, and drink to forget." The people of Night Vale hence have surpassed Harpham’s interval by means of desensitization. Even though they may not understand how things such as the Glow Cloud can exist, the citizens simply accept that they do. This desensitization and ignorance illustrates Csicsery-Istvan’s observation that, with the postmodern period, the grotesque monster no longer has to be an outsider and that the transgression of categories has become ordinary. What was conceived as monstrous in Lovecraft’s fiction is perfectly acceptable in Night Vale. It could, of course, be argued that in the Night Vale universe entities like Station Management or the Glow Cloud are simply part of reality and that they therefore are nothing unnatural or unusual. However, this claim is disproven by the fact that not all of the citizens have yet gotten used to these grotesque entities. For example, the scientist Carlos, who moves to Night Vale in the show’s pilot episode, is at first distressed by the things he encounters in the town. It thus appears as if the laws of nature are only different within the city limits of Night Vale. The longer Carlos is part of the community, however, the more he is desensitized to the unusual aspects of life there. When one day gravity itself suddenly stops to work in the town, the scientist is not surprised, but instead uses this opportunity to clean the gutters of the roof of his house during the episode “Lazy Day." Carlos’s development is a result of the “interpretive activity" that Harpham describes as the consequence of the confrontation with the grotesque, a process that changes the beholder, but not the grotesque object itself. The scientist has gotten used to the life in Night Vale and has gained a new understanding of the world around him, a world in which all conspiracy theories are true and paranormal things are simply a matter of fact. Understanding the grotesque in terms of Harpham’s theory, that is, the grotesque as an interval, and the perception of the grotesque as a process of entering and overcoming this interval, therefore explains why the same concept can have such different effects in Night Vale compared to Lovecraft’s writings. Whereas in Lovecraft’s fictions the interval of the grotesque is insurmountable, the grotesque in Night Vale has become normal – and has therefore ceased to be grotesque any longer. This effect is further emphasized through the different narrative techniques employed in the two examples, which render the monstrous grotesque of the Lovecraftian creature horrifying in Lovecraft’s own writings, yet ridiculous in the podcast.